After riding the Ducati, the Honda felt like an ocean liner full of cotton wool. The engine is smooth, linear and gradual, shoving you along with plenty of pace but nowhere near the same sense of urgency. 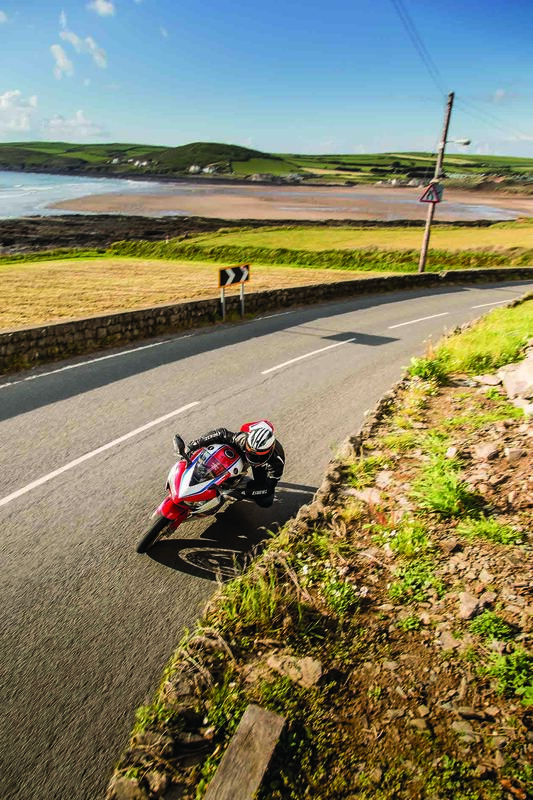 The ‘blade is so easy to ride and get on with; there’s no getting your head round riding modes, traction control settings or quickshifters, you just get on and go. It’s effortless. The SP version comes with Öhlins suspension and Brembo brakes (a common theme here), a single seat cowl, special paintwork and factory-matched pistons and conrods. The theory behind matching the pistons and rods is to get equal weights across all four cylinders, smoothing out the engine and making it rev cleaner. In all honesty I think you’d struggle to notice the difference even riding the motors back to back, but it’s nice to think about someone carefully weighing and picking out parts when they built your bike. In the same way that the Ducati is every bit as mad as you imagine, the Honda is every bit as refined. At all revs the engine sounds like metal components singing in perfect harmony, everything on it feels solid, perfectly engineered and just right. If it weren’t for the combined ABS brakes sticking their oar in every time I try to do a skid, it would be impossible to ever get annoyed by this bike. Even if it deliberately fell on me, I’d find myself admiring the finish on the inside of the cockpit as I lay there, trapped. The same with the riding, it’s so hard to get feedback out of anyone getting off the Honda, other than “Yeah, it’s really good”. It steers predictably, it’s rock solid stable on even the bumpiest road, and the engine always gives enough shove to drive forward, without ejecting up. The Fireblade has always been a fantastic bike, but now it has plusher suspension and superb tyres (Pirelli Supercorsa SP) as standard. It is an immensely capable bike that flatters your riding and works with you at every turn. But is that enough? The S1000RR really feels like the bike Honda should have built after the 2008 ‘blade. Now it’s traction control this and riding modes that and the current pinnacle of the sophisticated electronic age is unquestionably the BMW HP4. Traction control, ABS, riding modes, quick shifter yada yada yada, we’ve heard all that before. But what makes the HP4 unique is its semi-active suspension. Translated into normal-person speak, that means the bike looks at how fast the suspension is moving and adjusts the damping accordingly. For every bump. Not even Alan Dowds is that quick on the spanners. Add to all that technology a well thought out, well engineered motorcycle that doesn’t deafen or cook you and purrs smoothly at idle and you can see where the Honda link got into my head. There are plenty of manufacturers who’d love to have their engineering described as Honda-esque, but few who manage it. BMW has done a pretty damn good job here. But importantly, rather than play it safe and conservative, they saw fit to give us a genuine 190bhp engine that spins the Earth backwards whenever you pin the throttle. Hurrah for the Germans, all is forgiven. Where the Ducati, and to a lesser extent the Aprilia, take a little bit of dialing in to each time you get on, the BMW, like the Honda, makes you feel at home straight away. The electronics are the easiest to set up here, letting you toggle ABS and TC off at will, or switch through the modes for the right preset. In rain mode it’s soft, restrictive and probably impossible to crash. In slick mode, you can fine-tune the traction control from a switch on the left bar, if your brain has any spare capacity. At the speeds you’ll be going, I’d suggest saving the fiddling for the next set of traffic lights. The Ducati changes direction fastest, but takes more effort to get round a tight bend, the Aprilia feels like a 250GP bike and goes wherever you glance and the BMW is somewhere in the middle. It steers really well and darts into a corner, but the Aprilia has the edge on pinpoint accuracy. I suspect that has something to do with the BMW’s awesome power – that kinda overrules everything once you snap the throttle open. I don’t think 190bhp could ever be described as controlled, but the BMW certainly gets close. The power builds smoothly, with no sudden face-full of fork tops, unlike certain other bikes here. As the motor really comes on strong you can feel the electronics scurrying around trying to keep it in check. What this makes for is a bike that you can go impossibly fast on down any road. You just stick whatever skill you have into the pot and the electronics will make up the deficit between that and your ambition. Right here, right now the HP4 is the pinnacle of sports bike technology. There’s not a gimmick in sight, just innovations that make riding fast easier and safer, we’ll drink to that. Closed road. Photoshopped. No babies harmed etc. And so we come to the Aprilia, which you’ll have notice I’ve left until last. Regular readers will remember last year’s 1000cc group test, which the RSV4R had in the bag right up to the point where it broke down. Grown men cried. Experienced, impartial road testers were reduced to sobbing messes. This year, the RSV4 Factory was flawless, despite 1000-odd miles of hard riding day and night, sunshine and rain. The factory version gets Öhlins suspension, forged wheels, carbon fibre and magnesium finishes and a fully adjustable frame. Yes, you read that right – you can adjust the engine position, the head angle, swingarm height and the swingarm pivot position. That’s GP levels of adjustment there. Would you ever need to use that adjustment? Er, probably not unless you’re going racing, but for the tinkerers out there it’s a dream come true. The Aprilia’s styling hasn’t changed for a few years now, but why should it. It may not have the sophistication or classic beauty of the Ducati, but to people like us that are into their bikes, it says everything. Compact, minimalist to the extreme in places and purposeful. It looks small, light and fast and from the seat it doesn’t disappoint. At 5’8” I’ve always liked a small bike, something that you can throw around and feel in charge of. The Aprilia hits the spot for me, feeling way more agile and nimble than any 180bhp bike has a right to. The engine isn’t as flat and linear as the Honda, but it’s closer to that end of the spectrum than the explosive Ducati. But what you do get is strong drive from low in the revs, that builds and builds to a peak at the top end, by which point you’re having an eargasm at the sound. Then tap the lightest and slickest quickshifter here for another gear and another bout of horizon bashing. Because it makes power so smoothly, you don’t feel like you’re leaning on the electronics the whole time like you do on the Ducati or BMW. If you smashed the wheel sensors off all of them, disabling the electronics, the Aprilia is definitely the first pick for racing up a slippery road. When you do push on harder, the intervention from the TC is the least noticeable here (except the Honda which has no TC), just trimming off the excess enthusiasm and keeping you between the hedges. The TT. In Devon. Maybe. So the electronics are the smoothest (if not quite the simplest to operate), the engine is the best balance of power and useability, but they’re surpassed by the handling of this thing. 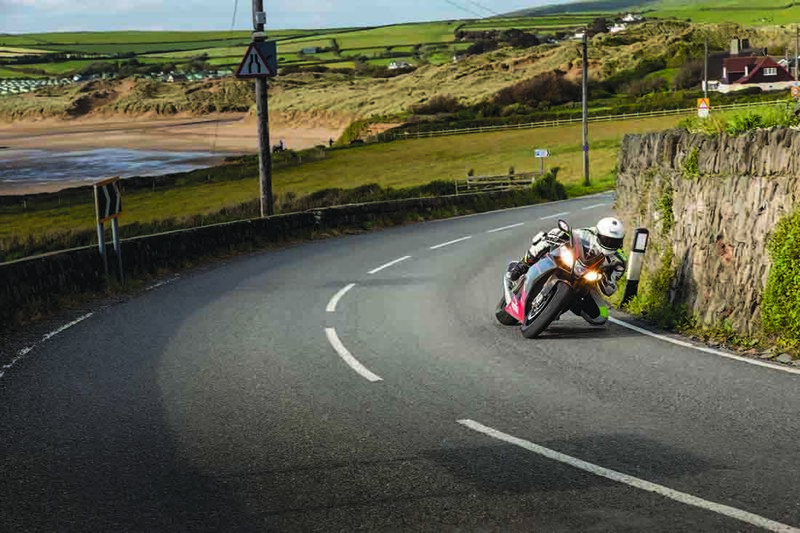 You’ve only got to cast a passing glance at an apex and the RSV4 is there, looking back at you asking ‘where to next?’ Every moorland road in North Devon got transformed into a TT track during the test and everyone was fighting over the Aprilia. It steers by intuition, it’s stable enough for silly speeds over the bumps and makes you want to stick a kneeslider on every apex. The Aprilia may lack the insanity of the Panigale, or the technology of the HP4 but neither can match the sheer pleasure of threading together a set of bends on the RSV4. 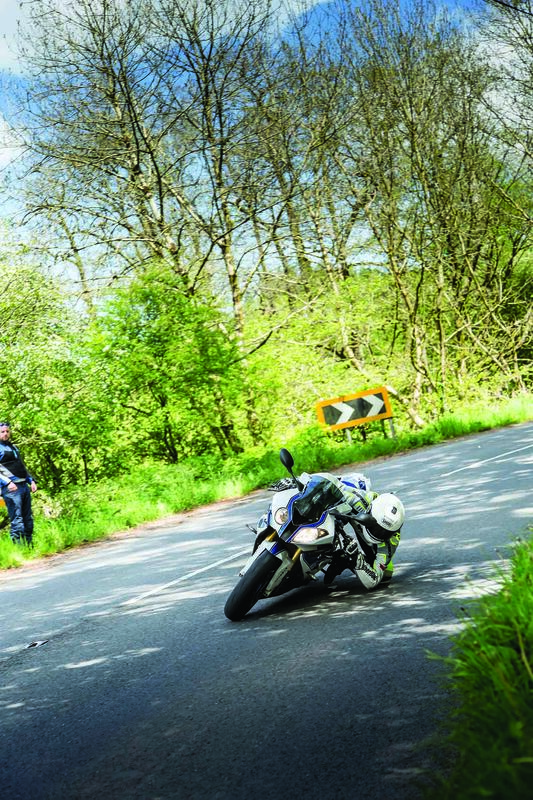 It’s the purest riding enjoyment of a lightweight sports bike, with the most useable 1000cc supersports motor ever built and traction control to pick up the slack. Why Aprilia sold fewer than 50 in the UK last year is both a mystery and a crime against humanity.